I made “The Best Ever Ribs” for the 4th of July. 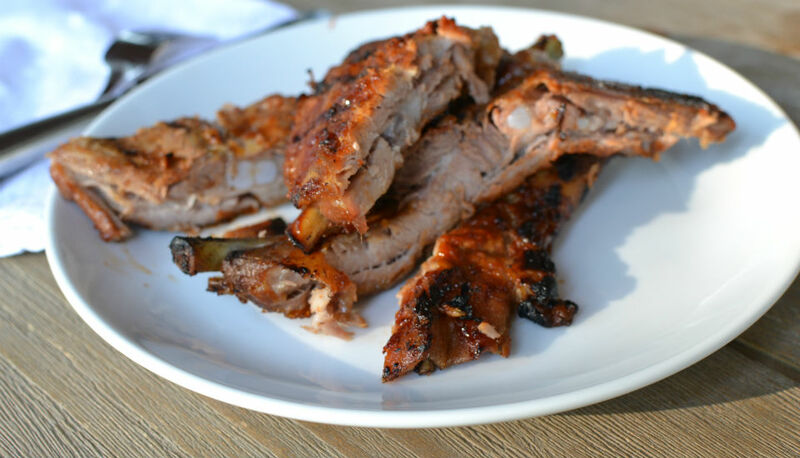 Mouth watering, fall off the bone, you will need lots of napkins kind of ribs. Perfect for a large crowd, since they are rubbed and baked the day before. Then warmed up with your favorite BBQ sauce the next day. This is my go to choice for BBQ sauce, and not just because it’s gluten free, because it is fabulous! Now I have said before that we eat what I am posting, right then and there. Because this is dinner you know, not just food that I cook and blog about. For the festivities we had 21 assorted adults and children for dinner and fireworks. Trying to be the hostess of the year, I had all of 1 minute to shoot these ribs and not neglect my guests. I got off three shots, and of the battery is dead on the camera, darn. Of course I do not have a spare (yet). If that hadn’t happened I would have fussed a bit with the shot, you know artfully place the ribs. Maybe add a bit of green to brighten things up, put a nice frosty mug of beer in the shot. That didn’t happen, but really it didn’t matter. It was a incredibly memorable day and the food was delicious. Starting the day or two ahead, preheat oven to 350 degrees. Combine salt, dry mustard, paprika, cayenne pepper, cumin and pepper to bowl, mix well. Place each rack of ribs on a double layer of foil and sprinkle both sides with rub mixture, approx. 1 Tbs per side. Wrap up and lay on baking sheet. Bake 2 1/2 to 3 hours, should be very tender but not falling off the bone. Remove from oven and cool overnight. To reheat, remove from foil slather each side of ribs with BBQ sauce of your choice and place directly on BBQ over high heat for about 7-10 minutes, turning often. Transfer to large cutting board, and cut between bones. Kathryn, you can do this!! One of my favorite foods. Doesn’t even seem too difficult and something a not so good cook like me could do. hey i have a really good bbque sauce too, shawn says its the best so that must mean something ,, maybe we can do a recipie together.. just an idea.. I can attest I was there and the ribs were great. Thanks again for a great evening….love your blog!